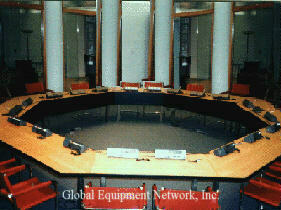 Global Equipment Network, Inc. can provide Simultaneous Interpretation Equipment for virtually any type of room setup. Whether the room is set up for a small boardroom meeting or is a large auditorium, GEN has the equipment and experience to handle any type of setup. 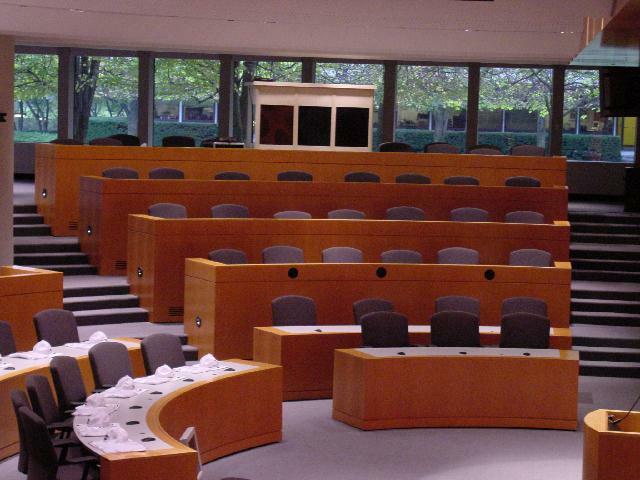 Although virtually any type of meeting setup configuration is possible, the most widely used setups are the Auditorium, Board Room, Classroom, Hollow Square, U Shape, Cluster and the Octagon. Setup style in which the participants are seated in rows of chairs with no table, desk, or writing surface in front of them. 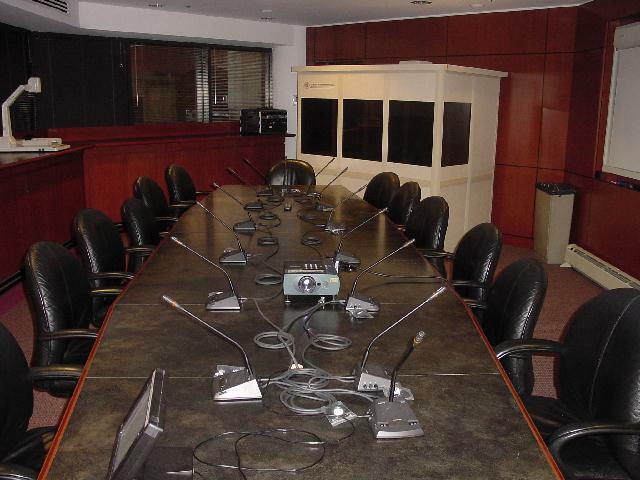 This type of setup is usually utilized for presentations where two way conversation is minimal and questions are accommodated by the use of an audience microphone. The security of the conference proceedings will dictate the type of Simultaneous Interpretation Equipment used at the conference. Setup style in which the participants are seated at a boardroom table. Suitable for Board of Director or Focus group meetings. Due to the nature of these meetings and the amount of interaction and participation from all members, the Delegate Interpretation System would be the ideal setup. Setup style in which the participants all face the front of the meeting room. Participants have a table or desk in front of them for taking notes and placing conference material. The amount of interaction from the group will dictate the type of Simultaneous Interpretation Equipment suitable for the conference. Setup style in which the participants are seated in a Hollow Square. This setup is similar to the 'U' shaped setup and is often called a closed 'U'. 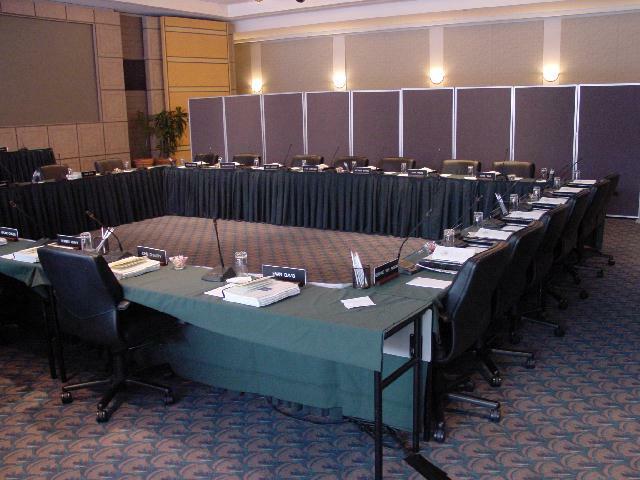 This type of setup is ideal for large board of directors / corporate meetings where all present can participate in the discussion. Ideal setup for the Delegate Interpretation System. Setup style in which the participants are seated in a 'U' shape. The open end of the 'U' is situated at the front of the meeting-room and provides an ideal location for the presenter. Participants have a table or desk in front of them for taking notes and placing conference material. Depending on the amount of interaction and the type of event will dictate the proper Simultaneous Interpretation Equipment for the event. Setup style similar Hollow Square in which the participants are seated around tables arranged in an octagon. 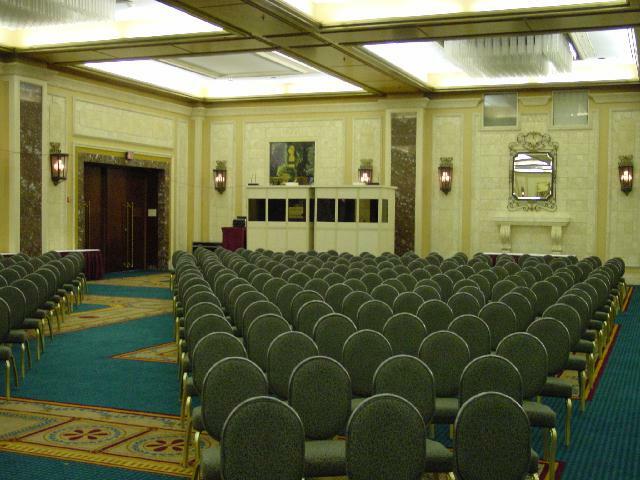 Seating arrangement allows for each participant to view any of the other participants. Ideal setup for the Delegate Interpretation System. 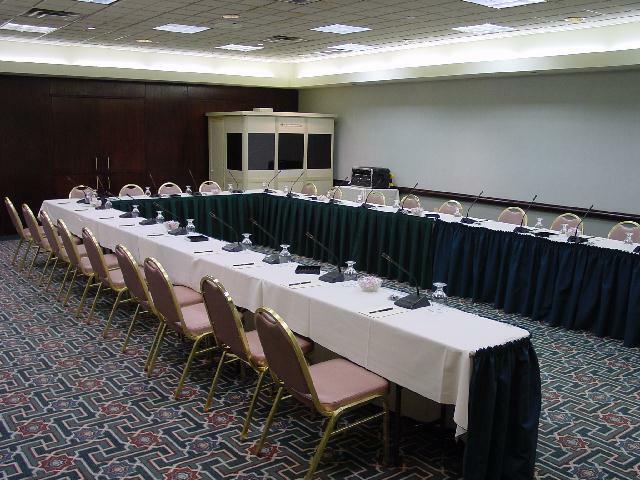 In addition to these basic setups, Global Equipment Network, Inc. can provide equipment for any type of meeting-room configuration. We have provided equipment for outdoor events, conferences requiring Hollow Squares in conjunction with auditorium setups and a multitude of various venues. If you have any questions regarding room layout, please do not hesitate to contact us for assistance.